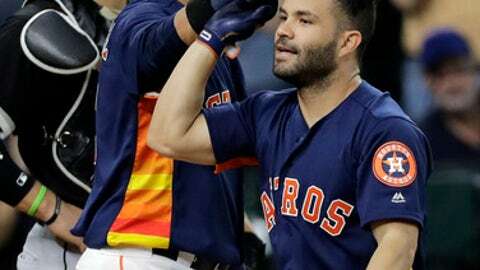 HOUSTON (AP) Houston’s offense cooled off on Sunday after the Astros piled up 23 runs and 30 hits combined in their last two games. The Astros managed just three hits and two runs in the series finale against the White Sox, but it was just enough to get a 2-1 win to complete the four-game sweep. Dallas Keuchel pitched seven strong innings, Jose Altuve hit a homer and the Astros manufactured the go-ahead run in the seventh to get the victory. Altuve’s solo shot put Houston up 1-0 in the fourth to help the Astros to improve to a season-high 30 games above .500 (61-31). Chicago starter Lucas Giolito (5-8) had retired nine straight after Altuve’s home run when Yuli Gurriel got Houston’s second hit of the game with a double with no outs in the seventh. He took third on a fly ball out by Josh Reddick and the Astros went up 2-1 on a sacrifice bunt by Marwin Gonzalez. Keuchel (6-8) yielded six hits and a run while walking three to win his third straight decision. ”It seems like everybody does their part and that’s how we win,” Keuchel said. Giolito had one of his best starts of the season, allowing three hits and two runs in a career-high 7 1/3 innings. But he continued to be plagued by a lack of run support with the White Sox being shut out in seven of his starts and managing just one run three other times. He fared much better than he did in his first meeting against the Astros this year when he gave up a career-worst nine runs in two innings of a 10-1 loss. Houston’s Alex Bregman went 0 for 3 with two strikeouts to snap his 12-game hitting streak, which was the longest active streak in the majors. Yoan Moncada singled with no outs in the seventh and Yolmer Sanchez walked. Both players advanced on a sacrifice bunt by Adam Engel before the White Sox tied it on a sacrifice fly by Tim Anderson. Engel doubled with one out in the fifth and reached third on an error by rookie right fielder Kyle Tucker, who made his major league debut on Saturday. But Keuchel left him stranded when he struck out Tim Anderson before Avisail Garcia grounded out. Giolito had control issues early, walking leadoff hitter George Springer on four pitches before plunking Bregman. He settled down after that, retiring nine of the next 10 batters before Houston got its first hit on the homer by Altuve. Altuve’s homer gave the Astros at least one home run in a season-long 15 straight games. Houston set a franchise record last season by hitting at least one in 19 games in a row. White Sox: Garcia left Sunday’s game in the middle of the sixth inning with tightness in his right hamstring and is listed as day-to-day. ”We did it because he felt uncomfortable,” Renteria said. ”If he felt uncomfortable, we weren’t going to push him. He’s had it lingering for a bit.” … OF Nicky Delmonico (broken hand) has gone 1 for 4 with a run scored in his first two rehabilitation games for Double-A Birmingham. Astros: SS Carlos Correa (back stiffness) has yet to resume baseball activities, but Hinch said there is still a chance he comes off the disabled list before the All-Star break. White Sox: Chicago is off on Monday before right-hander Dylan Covey (3-3, 4.82 ERA) is scheduled to start in the opener of a two-game interleague series against the St. Louis Cardinals on Tuesday. Covey is trying to get back on track after going 0-3 with a 13.20 ERA and 13 walks in his last four starts. Astros: Gerrit Cole (9-2, 2.70) will start for Houston in the opener of a four-game series with the Oakland A’s which begins on Monday. After the Astros play the Athletics, they’ll host Detroit for three games to complete a season-long 11-game homestand.